This is a week of transition, of return to routine. Our evenings are relatively quiet for most of the month, thankfully, as the soccer season ends and gives us a respite of a few weeks. This is good, because the kids are tired. And grumpy. (Oh yeah, I’m tired too.) Meanwhile, I want to keep track of what’s working, what’s changed, and what habits we’ve carried over from summertime. Music practice: This happened quite rarely over the summer, when everyone takes a break from lessons. Lessons started this week, and so did regular practicing. AppleApple makes her own schedule and sticks to it, mostly practicing immediately after school (piano and French horn; no cello this year, as orchestra has been removed from her class’s curriculum, sadly). Fooey and CJ practice before school (violin and piano, respectively). Fooey goes first, and I accompany her on piano when she requests it. CJ is in his second year of piano and needs me nearby to help with finger positioning, musical details, and, mostly, moral support … and the will to continue. Yesterday, I tried combining his practice time with some light exercise (for me) because, frankly, it’s quite tedious to hang around calling out “quarter note!” and “check your hand position” and “sounds like a sharp!” (I am my father, good grief). Anyway, that whole exercise/musical instruction combo didn’t really work. I kept having to drop the kettle bell mid-lift and those things don’t drop well. Tangent alert, post-tangent. Sorry. 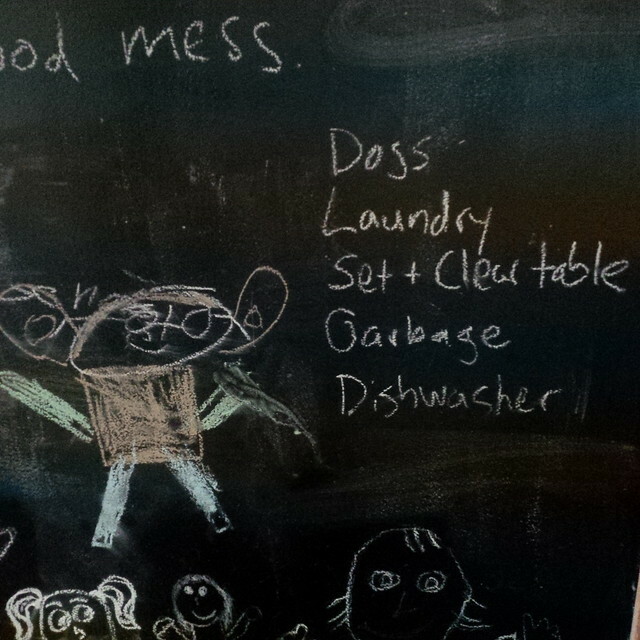 Chores: I have a list on the chalkboard of the kids’ chore categories: Dogs; Laundry; Dishwasher; Garbage; Set and Clear Table. Let’s break it down. Dogs: AppleApple is supposed to feed the dogs. But they’re eating fancy food after a (let’s not talk about) bout of stomach woes, so Kevin has been doing that. She is also supposed to walk them from time to time, which happens occasionally. Fooey is supposed to keep their water bowls full. That happens only when I notice and remind her. She does clean the fish bowls regularly, however. Laundry: I wash and dry a load or two (or three!) of laundry every day. Each of us have a labelled basket in the basement into which our clean laundry can be sorted. It’s each individual’s job to carry his or her basket upstairs and fold and put the laundry into drawers. Sorting the laundry into the baskets is the kids’ job. CJ is too small to sort effectively, so he is in charge of folding and putting away the leftovers that don’t have individual baskets: dishtowels, napkins, etc. A penalty is applied if the laundry is very poorly sorted: this requires oversight and judgement on my part. After all, even I have trouble figuring out whose underwear is whose. (The penalty is to have to sort the laundry again the next day, rather than it moving on to whoever is next in the line-up.) 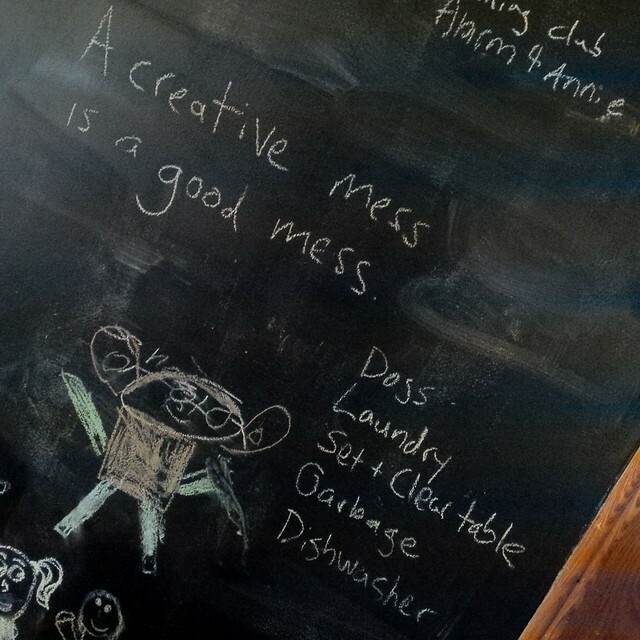 I also don’t pick up dirty laundry from the kids’ bedroom floors: if it gets in the hamper, it gets cleaned. This takes a great deal of restraint on my part. I hate seeing dirty clothes piling up! But I’m doing it for the team. Dishwasher: Each kid has a designated quadrant of the dishwasher to empty. In summer, the rule was the dishwasher had to be emptied by 11AM; if you forgot, you emptied the whole dishwasher yourself the next day. I must say this method of setting child v child was enormously effective. Fooey in particular would gleefully announce at 11:01 that so-and-s0 had forgotten. On week days during the school year, the dishwasher has to be emptied before school. Set and Clear Table: We’d meant for this chore to be shared equally, with the boys setting the table and the girls clearing every evening. But that never happened. Instead, what’s happened is that I ask whichever child happens to be around to set the table, hang the unfairness and griping. And everyone carries his or her plate to the kitchen after eating. It’s not much, I admit, but it’s better than nothing. Garbage: Albus is supposed to sort the recycling, and carry the bins in from the curb on garbage day. That did not happen much over the summer, and I forgot to remind him about the bins when he got home from school yesterday. Yes, the thing about chores is, people need reminders until it becomes habit. Breakfasts: We’re aiming for high protein breakfasts to get everyone off to a good start. Kevin is making a giant pitcher of smoothie in the morning: fruit, yogurt, kefir, almond milk. I’m also keeping boiled eggs in the fridge for breakfasts, lunches, or snacks. Lunches: Albus and AppleApple have been packing their lunches for awhile now — it’s habit. Fooey decided to start this year too. She has been working on her “knife skills,” and can now slice up an apple like a pro. (On day one, the apple looked like it had been hacked apart with a hatchet.) I get the kids to write food requests on our grocery list, posted on the fridge. Anyone know where to find seaweed snacks for cheap? Everyone loves them! Suppers: Our current routine involves me and Kevin texting back and forth around 3:30/4PM with meal ideas. Kevin can pick up ingredients on his way home. Obviously, these last-minute meals tend to be quick and easy. Last night we made pad thai with shrimp and tofu; it took us under an hour, and that was all we served, literally a vat of pad thai. Side note: Albus is excellent at making meal suggestions (that’s the hardest part of meal planning, IMO: trying to think up something different/healthy/appealing to feed everyone every single gosh-darn day). I also really like the Cookstr website for recipes, and I sign up for their weekly email newsletter, which is frequently inspiring. Homework: This applies less to the younger kids, but Albus started high school this week, which comes with more homework and tests. He also gets home from school relatively early. I’m encouraging him to take the opportunity to do homework immediately on arriving home: grab a snack, sit at the dining room table, enjoy the quiet house. AppleApple sets her own daily/weekly/monthly homework schedule, and is diligent about making plans and sticking to them. Exercise: I plan to continue running two mornings a week with friends, and doing one early morning boot camp, and one kundalini yoga class. I would love to swim one morning a week with AppleApple, but I’m not sure either of us can manage the early hour. I’d also like to run on the weekends and do a hot yoga class once a week. AND I’d like to start a mini running club with my kids (and any friends who would want to join), after school, running around our block in a 1-kilometre loop, so kids could decide individually how far they wanted to go. For this to happen, I will need to schedule times and dates. And I’ve now spent well more than 15 minutes blogging … a spontaneous blogging spree. This will have to last a few days.